Over two days, students will examine the attitudes that children from northern states had about slavery during the 1830s to 1860s and how abolitionists tried to change their way of thinking. They will also explore how woman abolitionists used anti-slavery fairs to generate support for the anti-slavery cause. What attitudes did children of the northern states have about slavery and how did abolitionists try to influence their opinions? How did woman abolitionists use anti-slavery fairs to advance the anti-slavery cause? The period before the Civil War, known as the antebellum period, was a time when slavery was practiced in southern states but not in the North. While some people who lived in the northern states were opposed to slavery, many people were indifferent to the issue of slavery. Their apathy stemmed from the fact that they considered slavery to be necessary for the production of cotton in the South. They also worried that if slaves were freed, they would come to the North and replace northerners in their jobs. And some feared that abolishing slavery would destroy the American way of life. 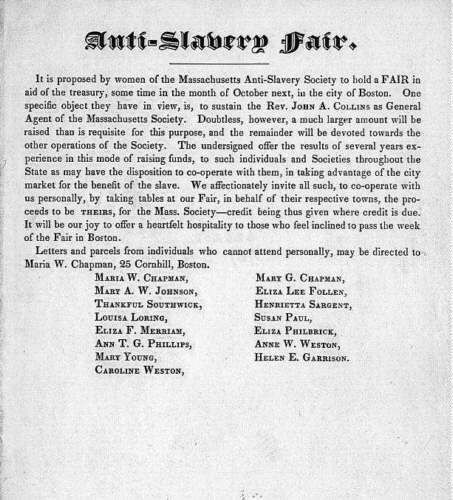 From the 1830s to the 1850s, anti-slavery organizations such as the American Anti-Slavery Society were active in Massachusetts, New York, and other northern states. These societies held conventions and local meetings where speakers lectured about slavery. The societies also sponsored publications such as The Liberator, The Liberty Bell, and The Slave’s Friend. One group that the abolitionists tried to influence was children. In order to persuade the next generation of citizens that the practice of slavery should be ended, abolitionists published illustrated journals and books that told about the evils of slavery through stories, poems, and skits. Along with men, women were active in abolitionist organizations. Even though women had limited rights, they carved out a special role for themselves in these societies and created activities that were suited to the lower status to which they had been assigned. For example, throughout the northeast, women held anti-slavery fairs. These events had a twofold purpose: They were used to raise awareness about the plight of the slaves and they were intended to raise money to support abolitionist causes and publications. Besides organizing the fairs, ladies made the goods that were sold there, such as gloves and handkerchiefs, quilts, anti-slavery publications, and refreshments. Students will discover why some children in Northern states were indifferent to slavery during the 1830s through the 1850s. Read the selection "Rose and Miss Belle" (written by Miss Sedgwick) from The Slave’s Friend to the class. Ask the students to think about how slavery is portrayed in this story. On the top of a piece of chart paper write the word "SLAVERY." Below it write as headings of three columns: "BAD," "NOT SO BAD," "WHO CARES?" Explain that the class will be discussing slavery and the attitudes that people had about it. Divide the class into groups of four students and give each group one of the categories of slavery (Bad, Not So Bad, Who Cares?) that have been listed on the paper. (A single category will be assigned to more than one group.) Ask the students to give reasons why people might have had the opinion of slavery that was assigned to their group. Allow time for group discussion. Bring the groups together and record the reasons that the students came up with to explain each heading. Explain that in the period before the Civil War, a time when slavery was practiced in the South, many northerners, including children, fell into the "Who Cares?" category. Show the students copies of the covers of abolitionist publications. Ask them to examine the covers to find out who published them and for what audiences. Ask the students why they think that the abolitionists would write anti-slavery stories, poems, and plays for children. Students will learn about approaches that women used to promote their anti-slavery views during this period. Read "The Slave Boy’s Wish." Ask the students to consider what they, as children, could do if there were slavery today and they wanted to end it. Elicit suggestions on chart paper. Explain that before the Civil War women had limited rights, as children do today, but that women were concerned about the issue of slavery and wanted to fight against it. One of the things that they did was to hold anti-slavery fairs. Show the students antislavery broadsides and announcements. Divide the students into groups of four and give each group a copy of one of these documents. Ask the students to use the documents to find out where these fairs were held and what types of activities took place at these events. Bring the students back to the whole group. Record on chart paper the activities that were planned for these fairs. Ask the students why women might have thought that holding anti-slavery fairs would be a good way for them to try to influence people about their views on slavery. Remind the students that anti-slavery fairs happened a long time ago. To highlight the differences between the antebellum period and our own times, you might describe how people dressed and what kinds of games kids played in that period, and mention that people living in that era had no electricity. Using the information that was recorded from the broadsides, ask the students to write a story, poem, or skit or to draw an illustration about a visit to an anti-slavery fair. Put children’s work into a pamphlet about anti-slavery fairs. Ask the students to apply the strategies of raising awareness about slavery that they have been exploring to a current issue such as world hunger or the environment. For example, have them write a children’s book or hold a fair or bake sale to bring attention to that issue. Carson, Mary Kay. The Underground Railroad for Kids (Chicago: Chicago Review Text, 2005). Gorrell, Gina. North State to Freedom: The Story of the Underground Railroad (New York: Bantam Books, 1994). Hamilton, Virginia. Anthony Burns: The Defeat and Triumph of a Fugitive Slave (New York: Dell Laurel-Leaf, 1988). Hamilton, Virginia. Many Thousands Gone: African Americans from Slavery to Freedom (New York: Knopf Books for Young Readers, 1993). Lilley, Stephen. Fighters Against American Slavery (San Diego: Lucent, 1998).